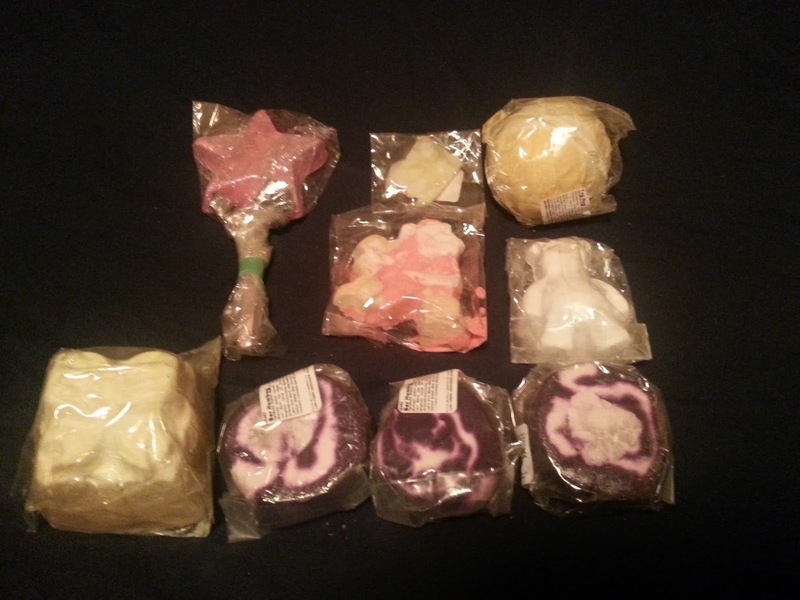 Deidre's Discoveries: Lush - BOGO Haul! I believe around boxing day, Lush had their BOGO event. 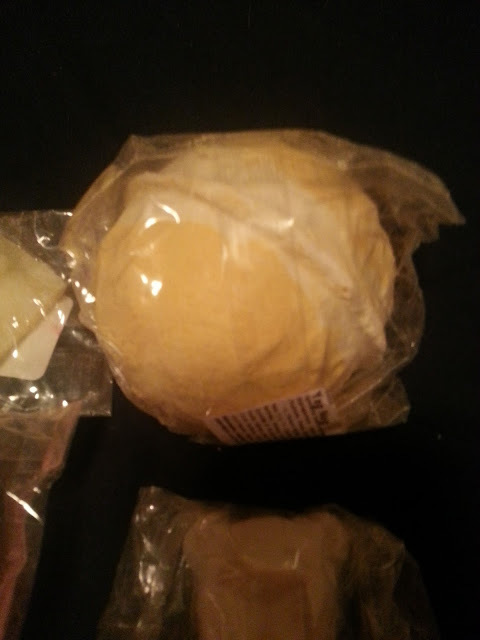 I didn't really NEED anything, but I wanted to stock up on some bubble bars, and I figured to give some new (to me) bath bombs a try! - I'm going to apologize now because the lighting in the photos are terrible, and I'm trying to find a decent spot in my house where I can take photos, and where I can set up some better lighting. Close your eyes, swish your Magic Wand in the tub as it fills, and your wish for mounds of sweet cotton candy-scented bubbles will be granted! There’s enough magic in this wand for several baths full of candy-scented bubbles and sweet pink waters, so pop it on the side of your tub for the next time you need a magical bathtime escape. The sounds like it smells delicious, and I love how they actually advertise it as being reusable! I haven't given this one a try but from the reviews it sounds as if you could use it a few different ways. One is to fill your tub a little, swirl the star around in the water for a little, then take it out, push the water around with your hand, turn the water back on, and you should get bubbles. Another one is to just hold the star under the running water. 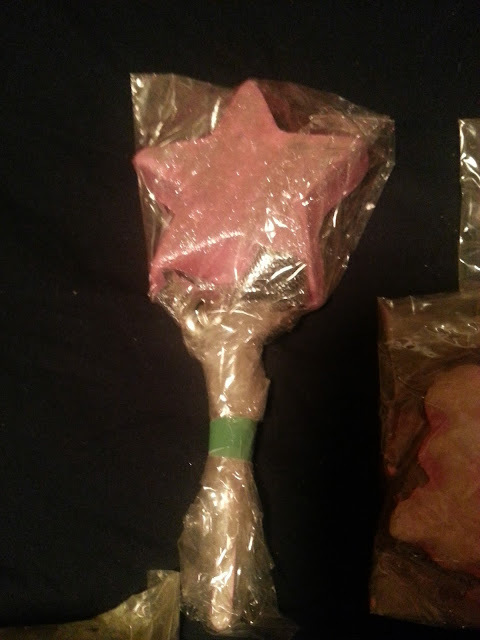 I suppose another way would be to break the star into pieces and throw those into the tub. But I guess that would take away from the novelty of the wand lol. I'll put a review up of this one once I try it! Fancy an uplifting cocktail? Cognac and zesty lime oils get this bath party started with mood-brightening scents while sweet orange oil refreshes the senses. In the water, this present-shaped fizzer unwraps itself to reveal glittering golden luster and a sparkling turquoise explosion. Don't wait until Christmas day to bathe yourself in festive luxury! 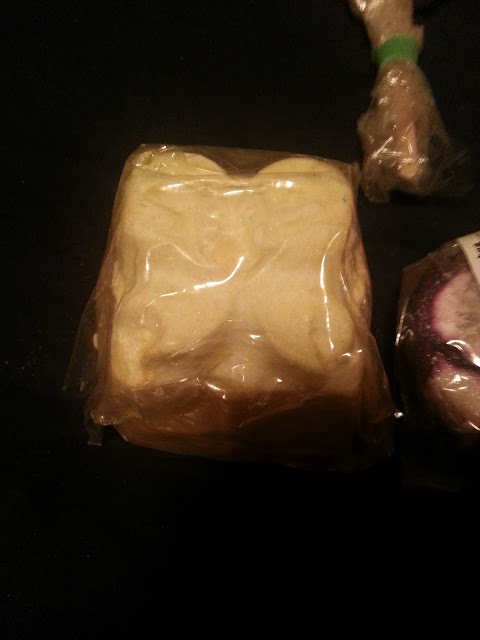 So this is a fairly large bath bomb! I just tried this one today so I don't want to get into too much detail here, as I have another post planned for it! The description makes it sound super fruity! It’s all humbug, I tell you. Humbug! If the Christmasy sights seem horrible as can be, cleansing tarragon mixed with relaxing fennel provide a welcome antidote. 'Tis the season of avoidable merriment, so pop on a frown and crumble this moody, deep purple bar under running water. Its enticing licorice scent with softening organic illipe butter provide safe haven for Scrooges. I LOVE this bubble bar! It smells amazing, it bubbles great, it doesn't stain my tub, and I got like 5 uses out of my last bar. I just love it! I did notice that they are all difference sizes, and I don't know if that's because they were rushing to get all of their orders out quickly. 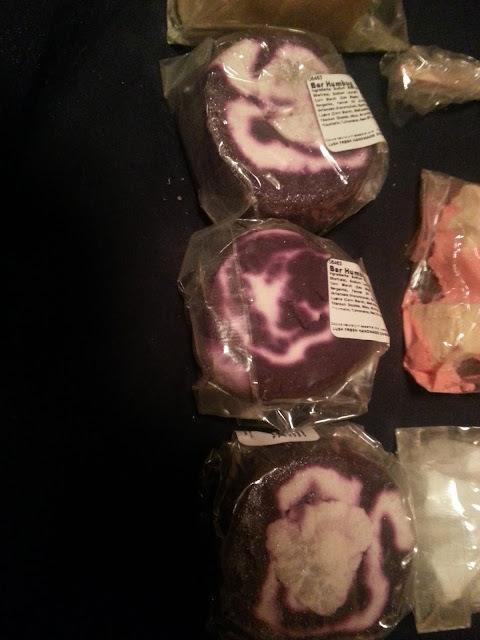 I did a quick review of it on my Birthday Lush Haul! I love it! 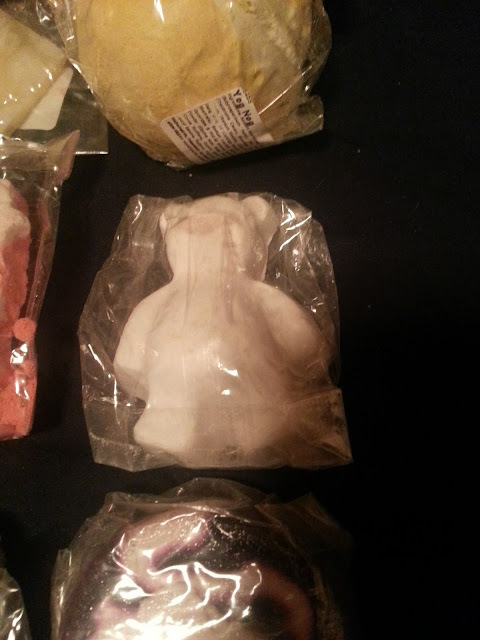 Molded into a friendly bear, this bath bomb has a generous helping of cocoa butter to give you the softest bear hug imaginable. It's great for nourishing and protecting skin, no matter how long you stay in the tub, and has the same vanilla fragrance as our Butterball Bath Bomb. The comforting aroma will even linger softly on the skin long after the bath. I haven't used this guy yet, but I have heard amazing things about how moisturizing and nourishing it is! He's super cute! Make a dash for this moving bath bomb with a cheerful and uplifting scent of satsumas at Christmas. Watch Santa fly about your bath as his golden boots fizz away, releasing toning mandarin oil, bergamot oil and orange flower absolute that help put a spring in your step, too. This one came a little broken up in the package as you can see. I thought it sounded as if it would smell great, so I had to give it a try. BOGO is such a great deal! Sweeter than dipping into the cookie jar, this luxurious bomb is sure to warm you up cold, frosty evenings. Spicy clove bud oil stimulates the senses while soy milk powder and organic shea butter create creamy, comforting waters. Luxuriate in comforting toffee soaks with clouds of gold and a touch of luster. I also did a quick review on this on my Birthday Lush Haul post. 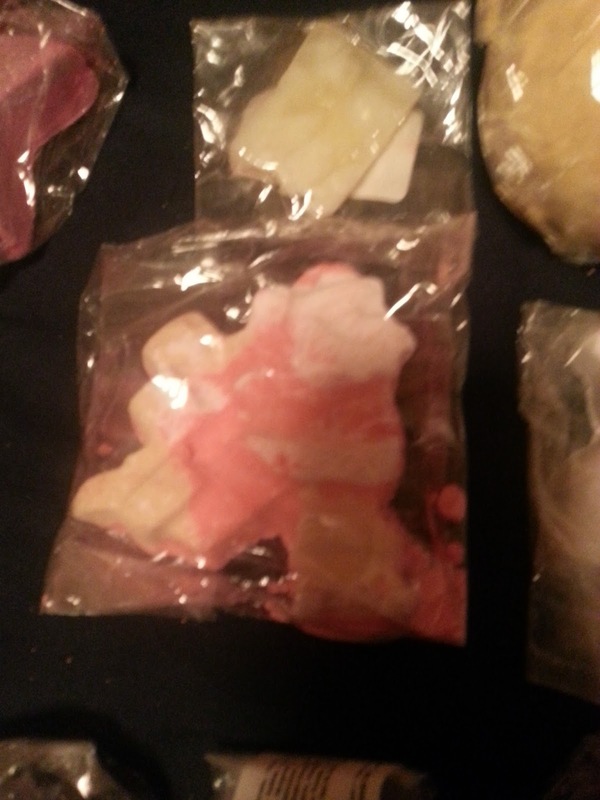 I liked the smell of it, and the bath melt inside is pretty cool. I didn't like how it left a ring in my bath tub, but it was super moisturizing. I wish they had cinders during this sale but it was sold out when I made my purchase. Did you pick anything up during the BOGO sale?! What did you get if you did shop? I really wanted to try the Cranberry face mask this year, but since they don't ship them, I never got to try it. I did manage to get to Lush once (for the first time ever) and they were sold out. They told me to come back the next day because thats when their shipment came in, but it's not convenient for me to get there, and yeah lol. Since I don't live too far, I wish they had a radius checker on their website and shipped stuff like that in the mail, especially in the winter when it's cold. But what can I do.. maybe they will bring it back next year, and I will just have to try again then. If I remember lol. Mmm... love that you got these goodies - by the time I got around looking at sale, everything was pretty much gone!